Last week, I was traveling from Canada down to the States to visit my mother in Boulder City, Nevada for her birthday. Since it is cheaper to fly from just across the border down to Sin City, my husband and I were scheduled to catch an early morning bus from Vancouver to Sea-Tac airport. It was during a coffee and snack stop at Sciué, an Italian bakery chain with a location on Pender at Howe, on our way to the bus that I stumbled upon my latest food obsession: hard-boiled egg sandwiches. It was cleverly disguised as a breakfast sandwich, so I missed the implications at first. Sciué’s Sodo sandwich features a hard-boiled egg sliced and smothered with mozzarella and freshly sauteed spinach. There’s a mayo or sauce similiar to Hollandaise on it, which I am not sure exactly the ingredients. Regardless, the hand-held creation was delish . . . and I knew I had to experiment in my own kitchen. What appealed to me about the sandwich was the fact that it wasn’t the typical egg sandwich. It wasn’t a sunny-side up or poached egg. It also wasn’t egg salad, oozing with mayo. It was meant to stand alone, like pastrami on a Reuben. It also could be served up for any meal and not just for breaking the morning fast. However, when I turned to the Oracle known as Google — I didn’t find a whole lot of recipes. Most were for egg salad or deviled eggs. There was one for a hard-boiled egg sandwich, but it included using butter as a condiment. There are three things I don’t add to my food, butter is one of them (The other two are salt and sugar). It’s okay mix in as an ingredient to a larger creation — but I don’t add it to my oatmeal, bread, etc. The exception being pancakes — on a rare occasion. Not only are these sliders easy to make, can use up ingredients in your fridge but they aren’t loaded down with added calories from excessive mayo. Plus, they pack quite a bit of protein — even if you leave off the steak! 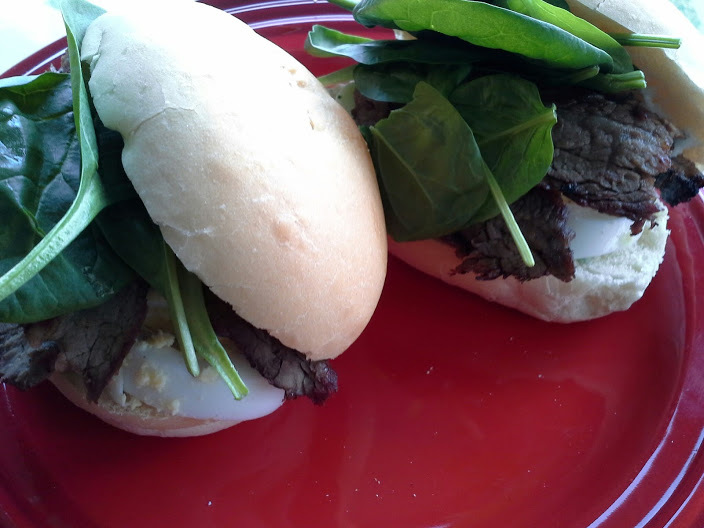 So, next time you are wondering what to make for lunch — consider a hard-boiled sammy. You’ll be glad you did.